'Finding Your Way Around Common Worship' is a simple yet essential guide to Common Worship resources. Mark Earey aims to inform readers of the basic and advanced resource options that Christians have available to them and how to use these options when required to do so. "How can I find which liturgical colour to use for a specific season/ celebration?" "Is it acceptable for a youth worker to perform a reading from The Message version of the Bible on a Sunday?" "What methods can be applied to make a baptism service as simple as possible?" "Is it okay to use the alternative form of the Decision for baptisms?" 'Quick Tips'-Where can I find this?" A simple guide to every Common Worship book published, what's in each one and when you'll need it. Overviews of all the Common Worship services in print and when you should use them. Things you can change in liturgy - and things you probably shouldn't! The Calendar and Lectionary - what they are, how they work, and how you can calculate dates yourself. 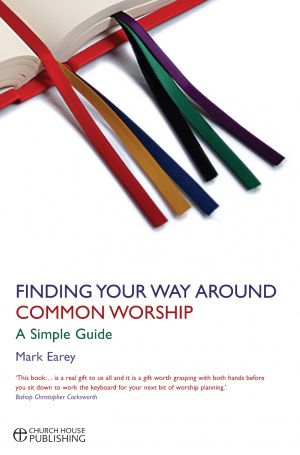 Finding Your Way Around Common Worship by Mark Earey was published by Church House in April 2011 and is our 7932nd best seller. The ISBN for Finding Your Way Around Common Worship is 9780715142363. The book of Common Worship has been around for more than a decade so here Mark Earey’s writing offers application and vibrant help. Its aim is to help users understand and use all the basic functions and to make them aware of the more advanced options, ready for the time when they may need them. Artistry, language and technicalities are well covered, with what may or may not be permissibly moved within liturgical tradition. The glossary I found to be of benefit and some freshness. This is an attractive, unique resource book for the glory of God and the joy of the people. Helpful indeed! Got a question? No problem! Just click here to ask us about Finding Your Way Around Common Worship. A:It includes a guide to church calendars and Lectionaries, but no actual calendars or Lectionaries. Thank you for using the Q&A Forum.